So….are you ready for some fútbol? We’re not talking American football here we’re talking soccer! The big games are finally here and we can’t wait to watch all of the action. Both of my tweens have played fútbol and I know how dirty it can get. Whether it’s bad sportsmanship on the field, off the field with the parents or grass and dirt stained uniforms, I know first hand that keeping it clean isn’t always easy. 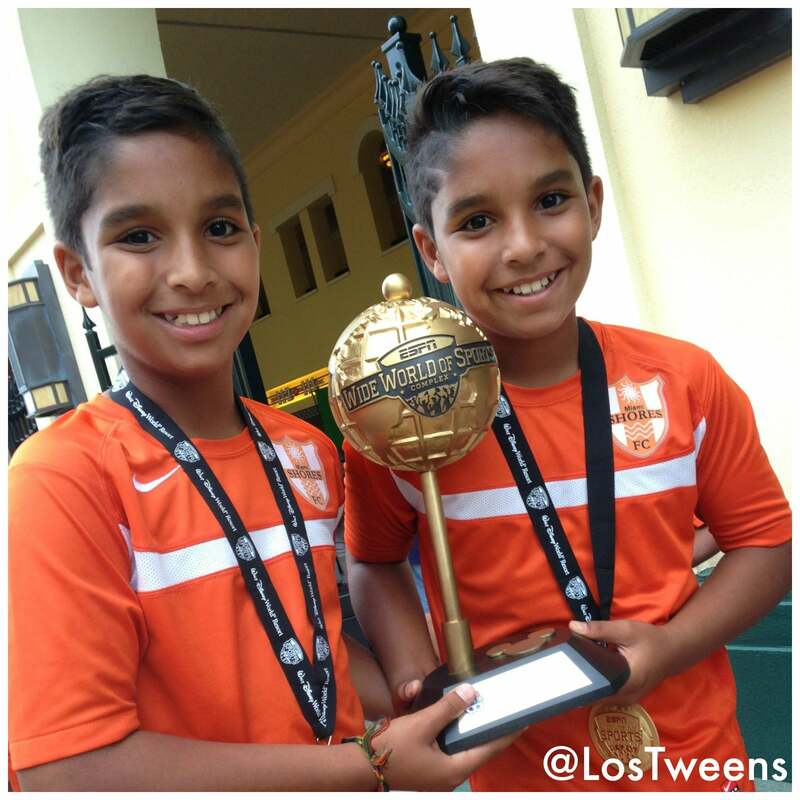 Santiago and Lucas – twin tweens! – and their U10 Futbol Trophy from the Disney Tournament – CONGRATS!! Yes, it is going to be tough but we’re rooting for Argentina as well! To help us be ready for the games, keep our jerseys clean and keep up with all of the laundry that piles up during the summer (why do kids feel the need to change 6 times just because they’re home!? ), we’re hosting a giveaway for a year’s supply of Tide and a “Keep It Clean” jersey! See all of the details below and visit Tide’s “Keep It Clean” Tumblr page to see all the videos and activities going on http://tidekeepitclean.tumblr.com/. AND be sure to check the Rafflecopter for additional entry options! Rules: Limit one entry per household. Open to U.S. Residents, 18 years of age or Older. Winner will be notified via email and have 24 hours to respond. 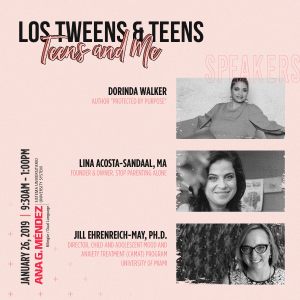 This entry was posted in Ideas, Raising Tweens and tagged Andres Cantor, futbol, giveaway, Keep It Clean, laundry, soccer, Tide, Tweens, world cup. Bookmark the permalink. We are celebrating fútbol in my house by having my son’s soccer team over. OH fun! That does sound like a great celebration! I teach my kids to keep it clean by making them pick up after themselves and put away what they get out. Hahaha! God one, Denise! That is important too! We teach our boys to clean up after themselves and they also have some small chores. Oh good! We’re starting a new chore – the dishes! We talk about being a good sport and player before the game.He always helps the kids get up when they fall. We also tell him to give it his all and to enjoy the game!! We love Futbol!! Candy, That’s awesome! When my daughter first started playing soccer, everyone stopped the to help one child get up…it was nice but funny! We Talk About The Importance Of Being Respectful And Kind To Every Player On The Field. Offer Hand Shakes And Kind Words After Each Game. 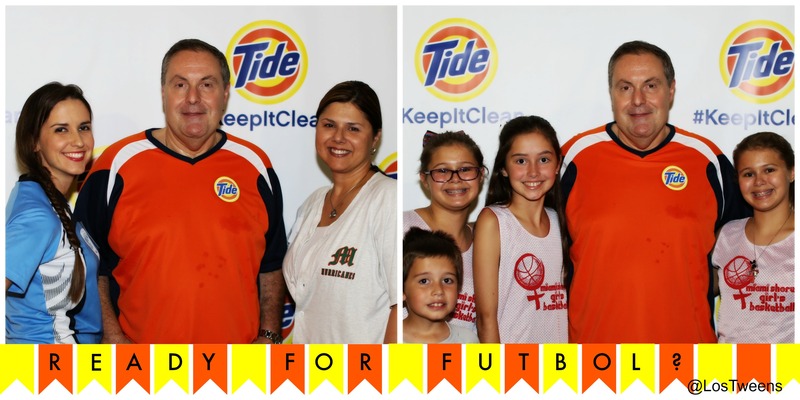 My Family Loves Soccer And The #KeepItClean Campaign! So important! Win or loose teaching children to show respect is one of the best things we can do. I teach my child good sportsmanship by looking at the positive things that happen in a game and the good plays. I also tell my child that it is a team sport and the team needs to practice and play together win or lose. That is awesome! After a game, we always talk to my daughter about what she did well and then wait until the next day to show her what she could do better. We make healthy and fun appetizers and we watch the games together as a family! Yum! Your appetizers are the best! Looking forward to some World Cup inspired ones! We’re celebrating futbol by having World Cup viewing parties and playing soccer in the backyard together. Woohoo! Sounds like fun, Geoff. I always taught my boys to be gracious winners and respectful losers. The important thing is to do your best and have fun. We teach our children to hold their heads up high even when in defeat and teach them not to brag and boast when winning. Always remember to shake hands with the other team in a win or lose situation. We tried to bring our kids up feeling that having fun and being with friends/family was more important than any score. We are teaching our son that to be a good sport means you don’t always win but you should shake the hand of the person that does. Just because you didn’t win doesn’t mean it wasn’t a good game worth playing. Were Definetly enjoying the world cup at home, since the guys work, us ladies at home are watching it for them ha ha.. but im enjoying with my mom and sisters while cooking comida mexicana, Were cheering fpr Mexico and same here wishing luck to all teams. Congratulate the winners and you can’t always win, so be a gracious loser. We are celebrating by having a great fiesta! We’re planning on watching the World Cup at home, we will be cheering on the both the US and Mexico. We planning on having over friends over to watch the games with us. I teach my kids what winning losing is really about and that as long as they tried they are winners. We’re celebrating futbol by watching the World Cup as a family. We are teaching good sportmanship by watching sports together as a family and talking about good and not so good sportmanship of the players. The kids pick it up really fast. They often are the first to comment. I celebrate with my family I wear the shirt and prepare a delicious meal to watch the games our teams together! I teach my niece to wash her hands before eating, going to the bathroom and before going to bed. I am having my friends over to watch the games and we have lots of good food and drink. I make sure that my children keep their hands clean whether at home or away before eating and after using the restroom. We will be having a pool party and cookout for my sons soccer team. We are celebrating by having bbq ! We teach our kids to know that is doesn’t matter if you win or not, that it’s about having fun and giving it the best you got, and to always thank your team members for a great game. We are also celebrating futbol by having a outdoor family BBQ. We are celebrating the World Cup by watching games together & having snacks based on the teams playing. I teach my kids to keep it clean by washing their hands often, picking up clothes of the floor and having a chore chart to help out around the house. They mark the chores off as they go. My daughter is a swimmer and we always praise the work she puts into her sport as well as focus on her improving her times instead of trying to “beat” someone else. We also always cheer for everyone and encourage her to do the same. We celebrate by having a BBQ and homemade icecream party. We are celebrating futbol as a family. We try to watch as many games together as we can. We are teaching our kids to Keep it Clean by putting them in charge of the recycling, trash, and composting. We want them to be aware of what goes into our landfills. 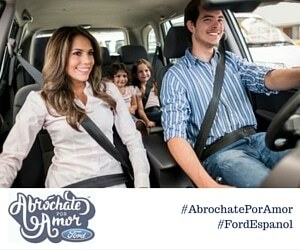 Watch the games together as a family.